How do I get the perfect shave? Firstly use either Somersets Exfoliating Face Scrub or Anti-Bacterial Face Wash to prepare and clean your skin. Then use either Somersets Shave Gel or Shave Oil to shave, and finally apply either Somersets SPF15 Moisturiser or Balm. Do Somersets Shave products help reduce razor burn? The lubrication of Somersets products helps reduce razor burn. One of the benefits of Somersets Shave products is that even after the razor has passed some oil remains on the skin so you can cover the same area several times for the closest shave whilst minimising razor burn. 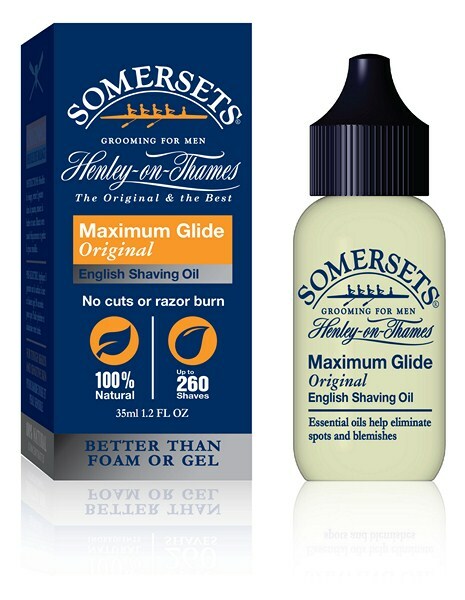 What should I do if my razor clogs when using Somersets Shave Oil? Tap the razor on the basin whilst running under hot water. If you are in a very hard water area try leaving a bar of soap in the basin, this can release the surface tension and help loosen the shave debris. Will Somersets Shave Oil leave an oily residue on my skin? The Oil simply rests on the surface of the skin during the shave period and is wiped off during the shave process. What remains has a positive hydrating effect. Is it really possible to achieve a great shave without lather or foam? The benefits of Somersets Shave Oils and Gels are that they are clear so you can see exactly what you are shaving and gain a more precise shave. Some gel and foam products can contain chemicals and surfactants which strips the skin of natural moisture leaving it dry and uncomfortable.